The Black Panther Deluxe Adult Gloves come in One Size Fits Most Adults. You can’t have a Panther without claws! 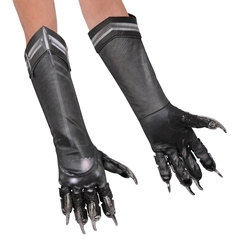 These gloves are the perfect fit for a Black Panther Costume for Cosplay or for Halloween. Pair with our Black Panther Adult Mask or Black Panther Adult Costume to complete the look!